This time of the year has me wishing for Spring. January just isn’t a fun month. Between debt and added weight from the holidays, it’s no wonder so many of us are ready for warmer weather, a larger bank account, and a smaller number on the scale. 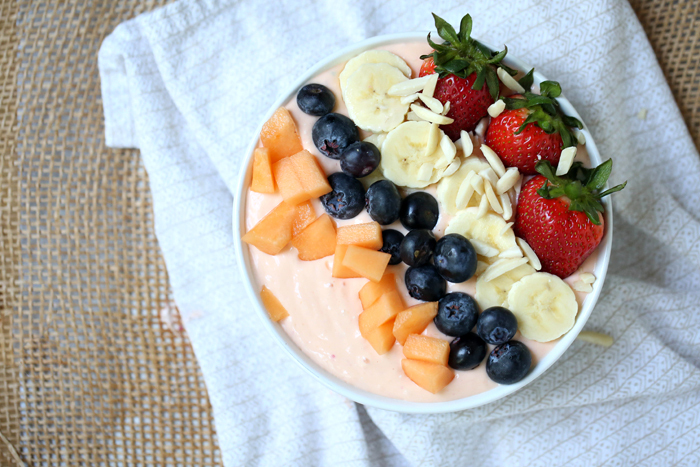 That was the inspiration behind this Tropical Smoothie Bowl. 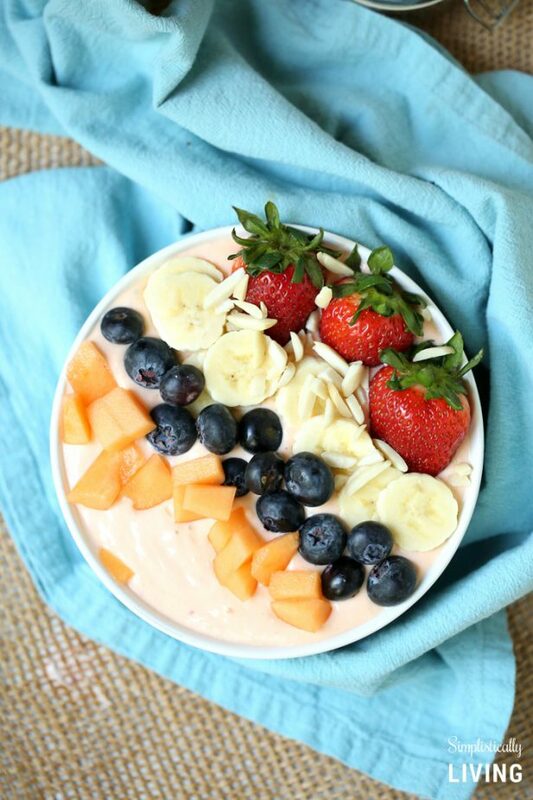 This Tropical Smoothie Bowl is all the taste of Spring/Summer without all the guilt. 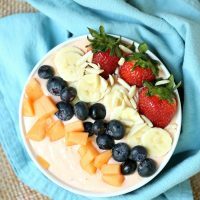 This smoothie bowl is absolutely delicious but healthy too. I also want to mention that it’s a great way to get in some probiotics. When I became pregnant with my youngest son (he is now 4) I ended up having some pretty serious digestive and stomach problems. I have tried many medications which seemed to help a little but what has really helped is putting good bacteria into my stomach. Yogurt is a great way to do that! A fermented food such as yogurt naturally contains lots of probiotic cultures that strengthen the digestive tract. 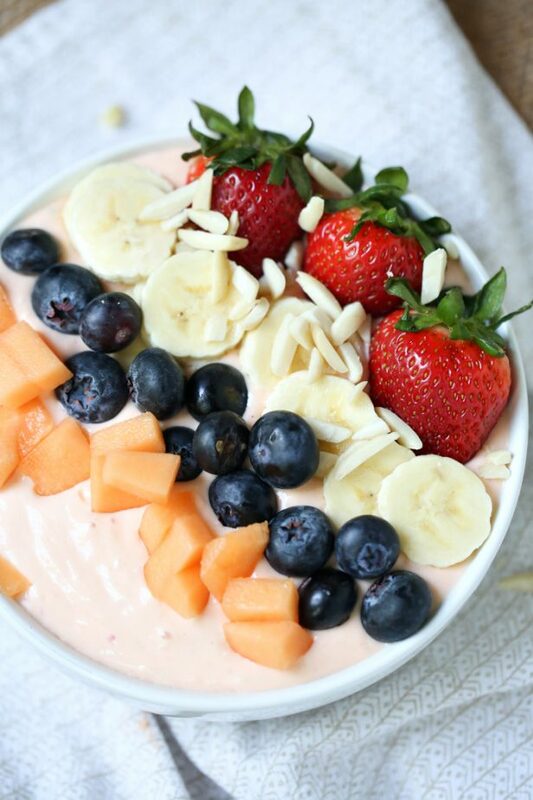 Some Greek yogurt also boasts added probiotics like Lactobacillus acidophilus and Lactobacillus casei that may help increase the good bacteria in your gut. So there ya go, if you have any stomach issues whatsoever, try eating yogurt. 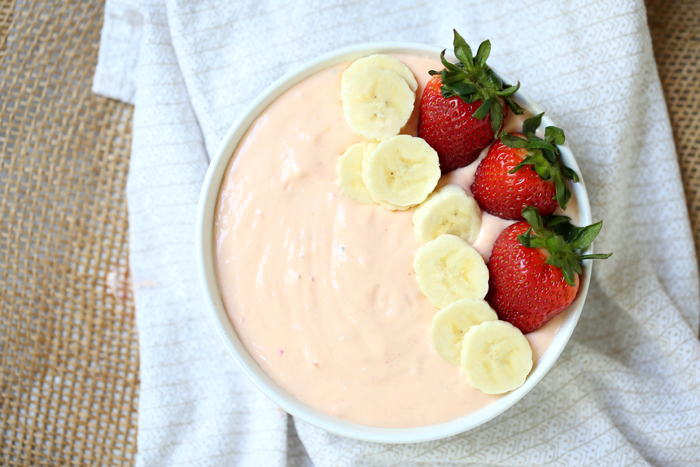 And, if you have landed on this post, this is an amazingly tasty recipe using greek yogurt! So, you’re getting that extra dose of probiotics mentioned above. First start by throughly washing your fresh fruit. 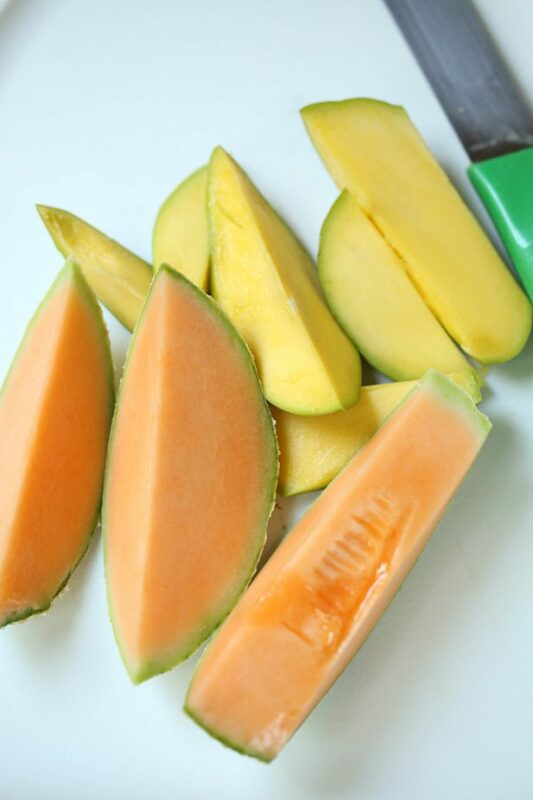 Cut your fruit into bite-sized pieces. While this isn’t necessary, it does help blend easier in the food processor or blender. 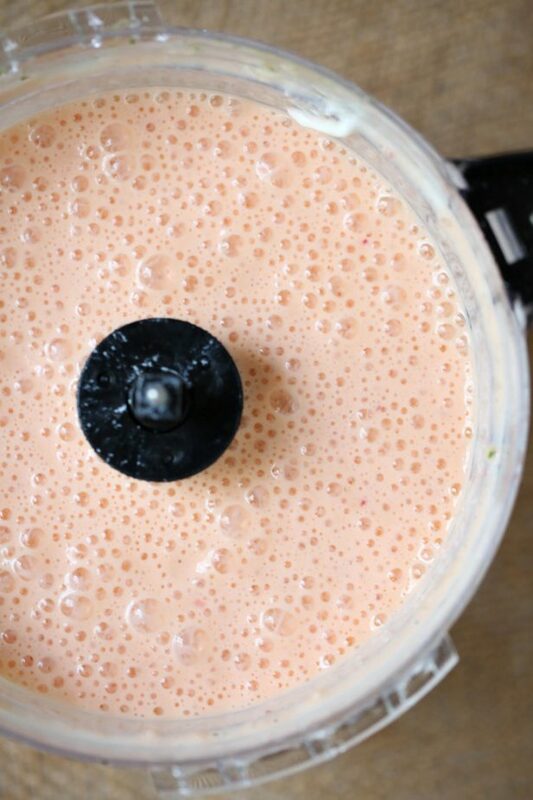 Blend all ingredients in a food processor until smooth. If mixture is too thick, add in almond or soy milk, 1 tbsp at a time until you reach your desired consistency. 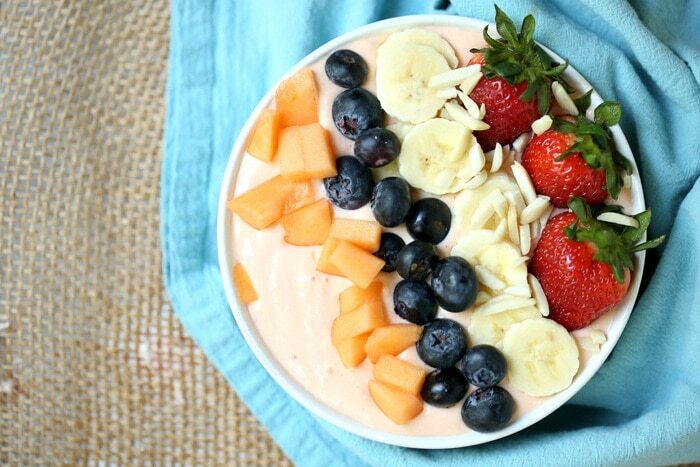 Finally, top with blueberries, sliced banana, diced cantaloupe, whole strawberries, and a few sliced almonds. Tip: If you are allergic to almonds, you can opt for a few small pieces of white or dark chocolate. Absolutely! You can make this recipe the night before and store in a container for morning. You can also double or triple the recipe and store in mason jars for the week. Can this recipe be frozen and made later? Yes! 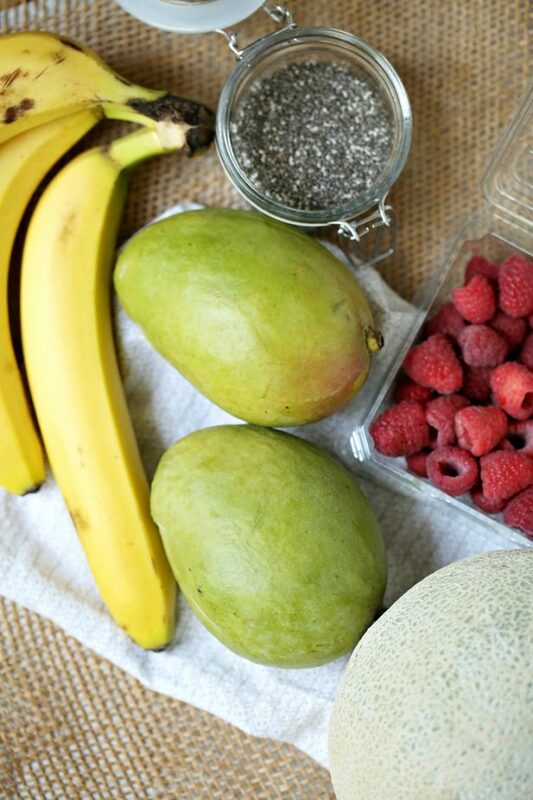 Simply cut up all your fresh fruit and put into a large freezer zipper bag. 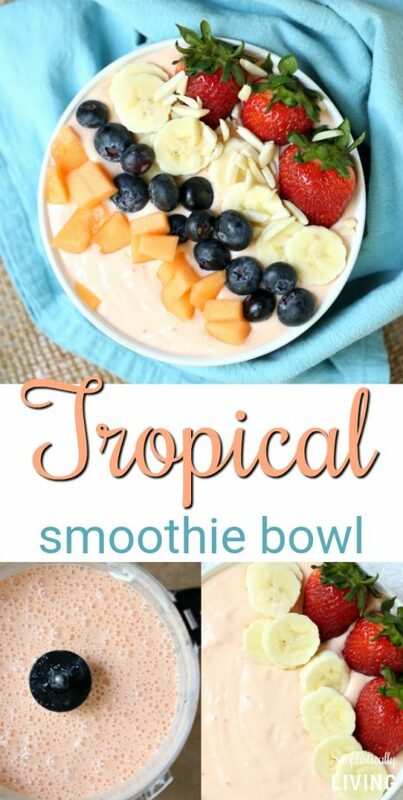 When you’re ready to make this, pop the frozen fruit into the blender, add some yogurt and it’s ready to be eaten! Yes! As long as your child doesn’t have an allergy to any of the ingredients used, this is something kids can eat too. It’s delicious and nutritious. I’ve personally found that my kids are more likely to eat their fruits this way than on their own. 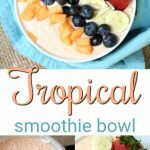 Tropical Smoothie Bowl - a delicious and nutritious way to get in your daily intake of vitamins and probiotics!